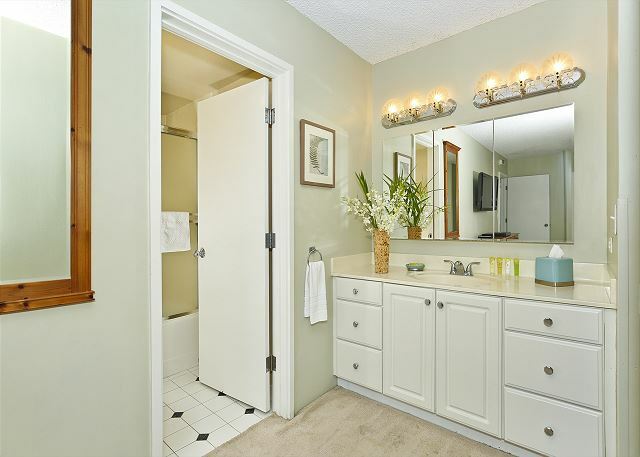 Pleasant , well equipped condo in great location. Mahalo, Hazel! We appreciate the feedback and will look forward to your next visit! 6. The furnishing were fine, but they do not match the picture. 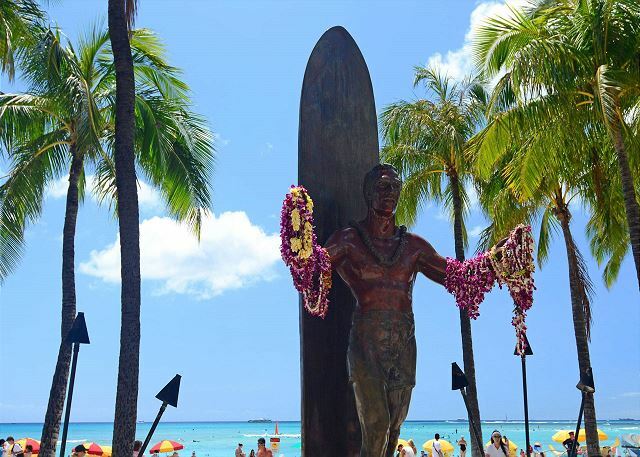 Aloha and mahalo for taking the time to post a detailed review about your recent stay. We're delighted you enjoyed your stay! Thank you for alerting us to the maintenance issues you encountered. Your feedback helps ensure we keep doing things right and correct those things that have fallen below our standards. We value you as a customer and look forward to welcoming you back on your next visit. Great location. 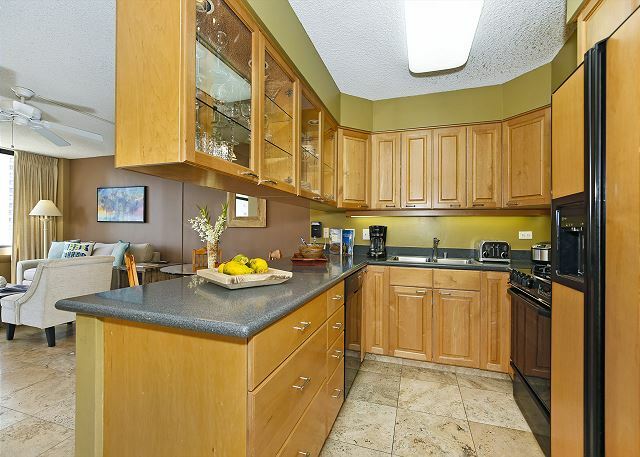 Very roomy with full service kitchen. Quick response from management when needed. Enjoyed our stay. Mahalo, Carolyn for the positive comments and recommendation! We look forward to seeing you on your next visit! Great location! Very comfortable for family of five. We would love to stay here again if we're ever able to stay for another month! Aloha Kimberly! Thanks so much for sharing your experience of your recent stay at Aloha Towers #12B. We are happy to have provided your family all of the needs you required for a wonderful vacation! We think James and Byron are super to work with, too! We hope to see you on your next visit. We were very impressed with this rental. 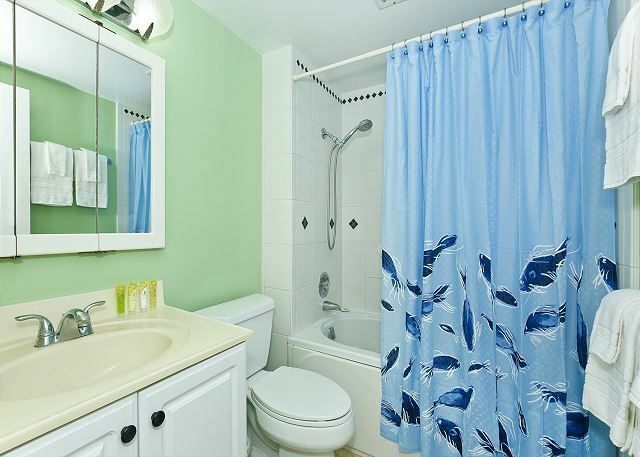 Very clean and tidy, like home away from home with the furniture and all appliances that you would use at home. Would strongly recommend staying here only a short walk to the centre of Waikiki and to beaches. Mahalo, Barbara! We're so glad you enjoyed your stay! Please come visit again soon! We had an amazing experience at Aloha Towers. From the get go, Byron was super nice on the phone and James who met us in the unit was great. He was very professional and answered our questions. I was blown away by the amount of stuff that was already included in the unit. I wish I had called ahead because it would have saved me some luggage space!! They even included a stroller which would have come in handy if my kids were a little younger. The location was great. It was within walking distance to one of the best shopping strips and all the highly rated YELP restaurants. This unit truly had all the comforts of home. I would definitely stay here again the next time we are in Honolulu. Mahalo, Jenny, for the great review! We truly appreciate your feedback. We'll pass on your comments to Byron and James - they're both real assets to the Captain Cook Resorts team! We enjoyed our condo very much and enjoyed walking throughout Waikiki. Travelled around the island and had a great time. Thanks very much. Mahalo, David! 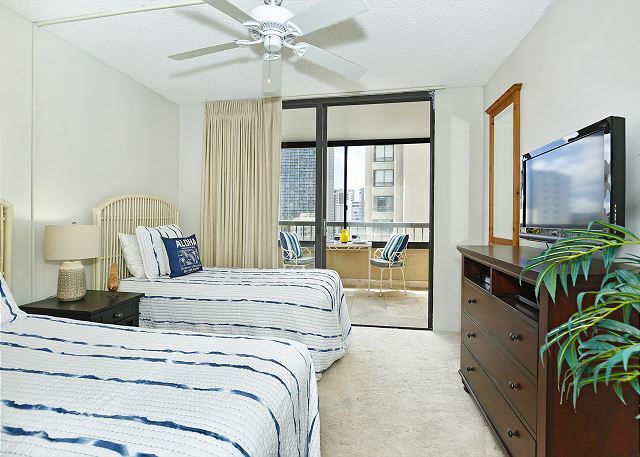 We're so glad Aloha Towers 12B worked out so well for you and the family! Hope you're able to visit us again soon! 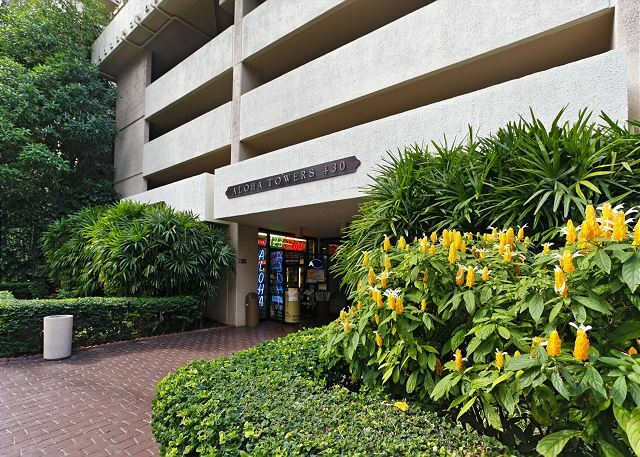 Very lovely, convenient condo with all the amenities necessary to enjoy Oahu. Very clean, quiet & comfortable with a nice view, not ocean, but still a nice view. Enjoyed the pool & gas grills several times during our stay. Also very clean & well kept. Good parking facility & also convenient for guests staying a few hours. Mahalo, Laurie! Hope you're able to visit us again soon! being able to extend our stay until 9 pm before catching our late flight. 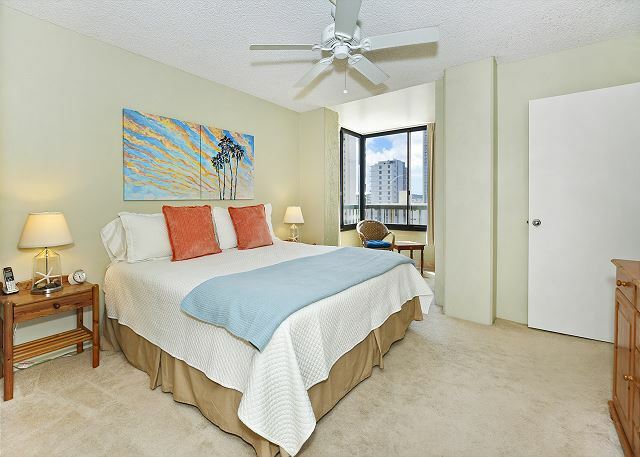 Close to amenities, shopping, good restaurants and beach. Walking distance to Hilton for conference. We hiked Diamond Head twice. Excellent value for rental cost. Mahalo, Lili, for the great review and recommendation! This property met our needs satisfactorily. Just a few comments: 1) We were very disappointed that the sauna and whirlpool were not functional because it rained the first several days we were there. It would have been nice to have them working. 2) Having the trash "room" right next to our front door was rather unpleasant. The smell was pretty obnoxious when entering and exiting the condo. INSIDE the condo was absolutely fine however - no smell. 3) The A/C was decidedly unevenly distributed. The master bedroom was VERY warm and the 2nd bedroom was VERY cold. All in all the rental worked out for us. We had two young children with us - they made use of the pool even in the rain and were very happy to have the space inside the condo to spread out and play. One last note: Byron was ABSOLUTELY FABULOUS! He went out of his way to make our stay comfortable and we are very thankful for his help with the parking situation. Mahalo Virginia for the great review and recommendation. We apologize that the building had the pool and whirlpool down during your stay; unfortunately there is never a good time for that! We'l be sure to pass your feedback on to your property manager, Byron; he's a real asset to the Captain Cook Resorts team! Amazing staff and condo. Great location (close to everything, but very quiet) good views across to the local high school sporting yards. Very happy with the experience and time spent in Hawaii. Highly recommended. Mahalo, Tamara! Hope you can plan a return visit in the near future! Spacious apartment with everything you need . Our unit was in a perfect location to walk anywhere . Everything was immaculate and clean and we relaxed the minute we walked in . The whole building is very well maintained. Mahalo, Helen for the great review and recommendation! Come back for another visit soon! 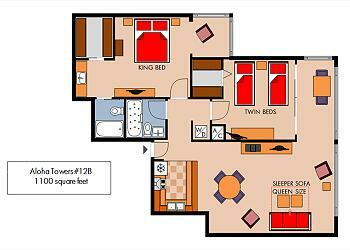 We were very happy with Aloha Towers 12B - it was actually better than we expected and we decided to stay on longer. The Captain Cook team were exceptional too. Mahalo, Andrew! We hope you can visit us again soon! Had a tsunami warning whilst there and Captain Cook kept us advised at all times. Ensuite bathroom not the best for disabled or elderly access. Only 5mins from beach and the pool and hot tub there where well used. Good location and we will be back. Mahalo, Trevor, for the great review and recommendation! We look forward to your next visit! The most notable distinguishing characteristic of this unit is that it has an enclosed lanai which might be an attraction to families with small children prone to climbing. The unit is in good condition and the property manager Byron is highly responsive. Mahalo, Marcus! We appreciate your continued patronage! We had a great stay at this apartment. Our two children are young adults so we like to be together and enjoy the space rather than getting two hotel rooms and feeling like you have to go out all the time! This was the perfect place to walk from to the beach, starbucks, dinner and all the places to shop. It was perfect. Great for my little family. Everything was exactly as described in the listing. 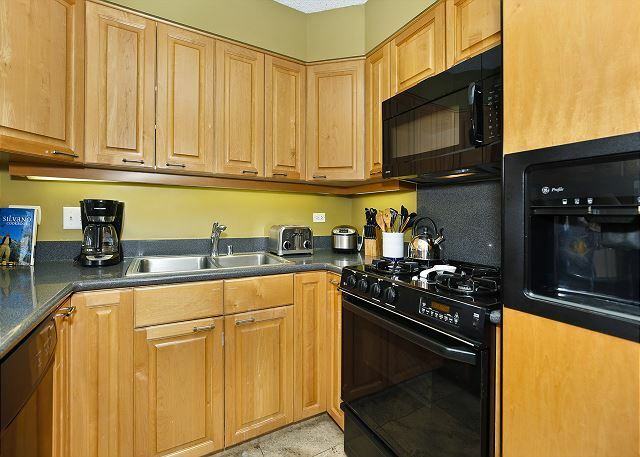 Clean condo w/newer appliances. Friendly, quiet building. Decent sized pool area. Easy to walk to everything. 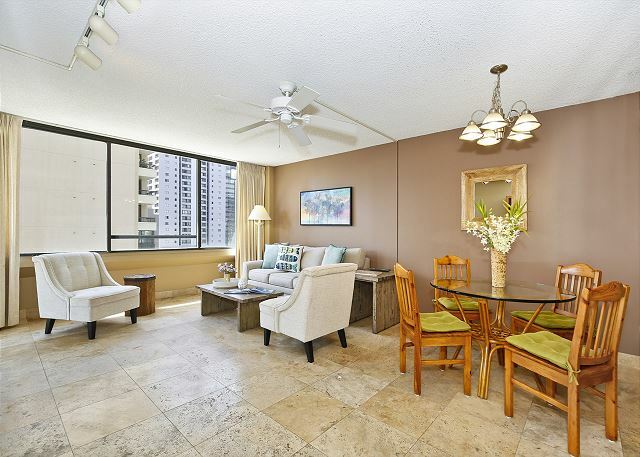 Condo is located in a great area close to Waikiki. We bused to Pearl Harbor and to Diamond Head and had a great tour of the island with E Noa Tours. Our guide was excellent. In a very busy area we felt very safe. Mahalo for the positive comments and recommendation! Sounds like you had a great tour of the island, too! We look forward to seeing you on your next visit! 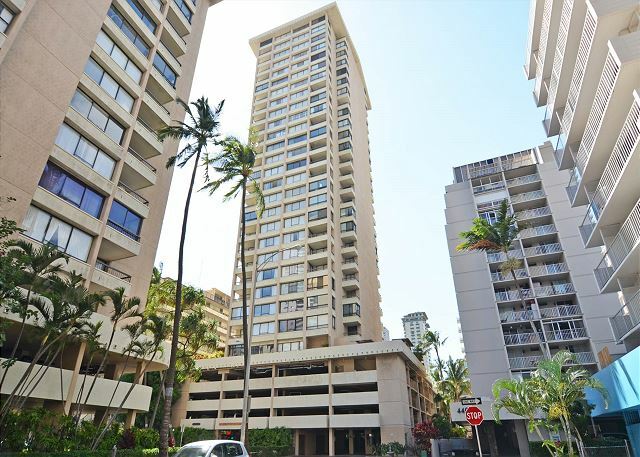 We'd stayed in this building before and think it's a great location in Waikiki. The building is a bit tired, and the parking spaces in the garage are tiny (watch out for slightly larger cars, they will be a problem). The condo itself is nice. 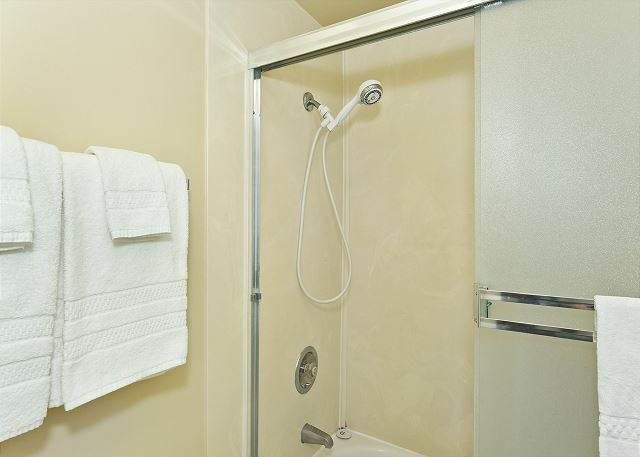 Everything works, including air conditioning, gas stove, washer/dryer in the unit, baths/showers, and the beds. The Wifi internet connection is very slow and frustrating to use. Fortunately we had smartphones we could use over cell towers, but using a laptop was very frustrating. It's included in the price, but the price isn't inexpensive, so it would have been great if that could have worked better. The people we worked with at Captain Cook were very nice and easy to deal with. If there is only one criticism it is probably that a lot of the furniture is a bit uncomfortable. It looks nice but my back is hurting now. Mahalo for the review and the recommendation. We're sorry you had trouble with the WiFi - did you try using the ethernet cable to connect directly? Because parking is at a premium on Oahu, you'll find that smaller parking spaces are the norm, unfortunately! Our unit was wonderful there os really 2 things that we think would make the unit better. Carpet change to laminate flooring and have open lanias. We prefer having some out door seating area.Overall property, unit and rental experince was great will use Captin Cook's for future bookings. Everything went according to plan. Mahalo for the great review and recommend! 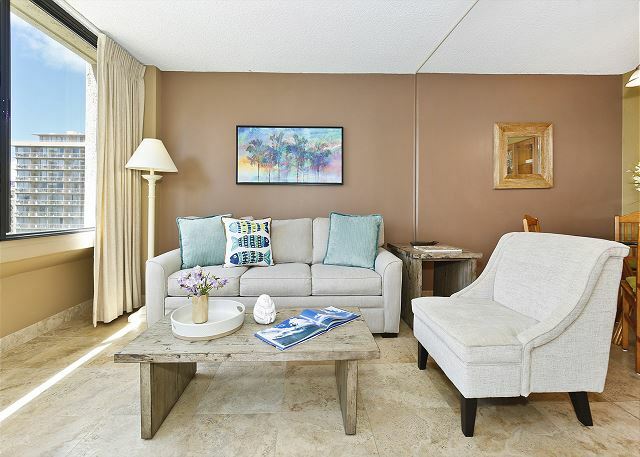 Although many guests prefer more interior living space, the majority of our properties have open lanais! Give us a all when you're planning to book our next visit and we'll help you find the perfect one! 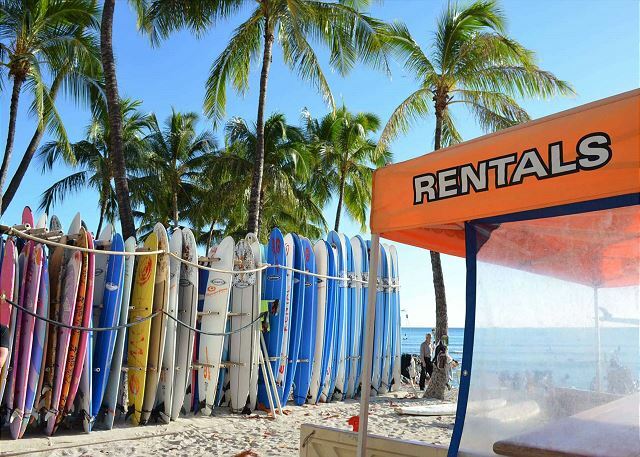 Loved the location, out of the bustle but only minutes to join the throng of Waikiki shopping and dining or, as was often the case, beaching. We were so comfortable in the apartment which had every thing from coffee brewer to beach noodles. It was clean, comfortable in very good condition and safe. All it lacked was a decent sized fry pan and a cheese grater. But that is such a small ask. 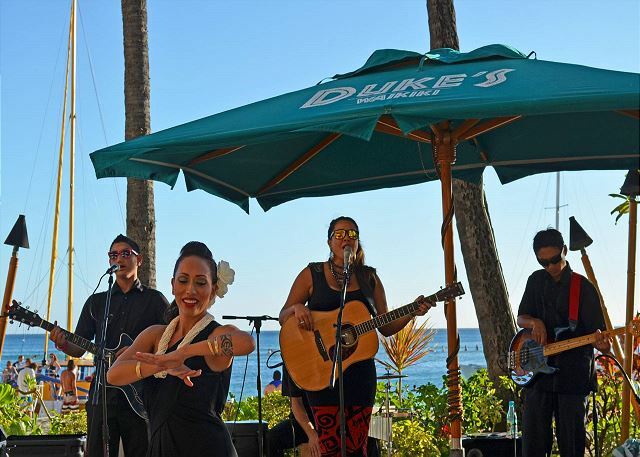 Mahalo you for the great review! Please know that a quick call to your property manager about incidentals you may need would have remedied your request! We want your stay to be as comfortable as possible. 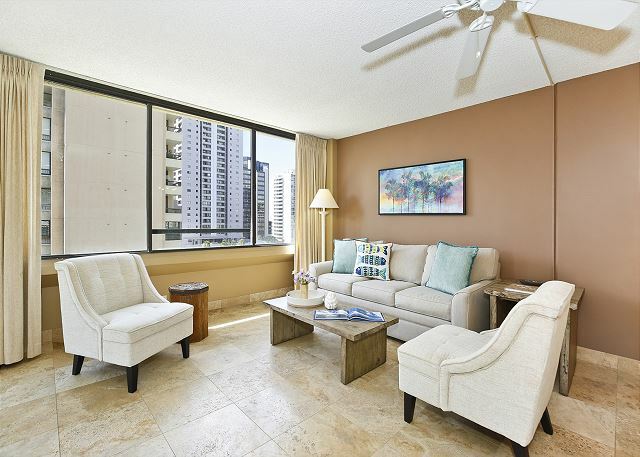 The condo at Aloha Towers was perfect for our stay. It was comfortable, clean and in a perfect location. 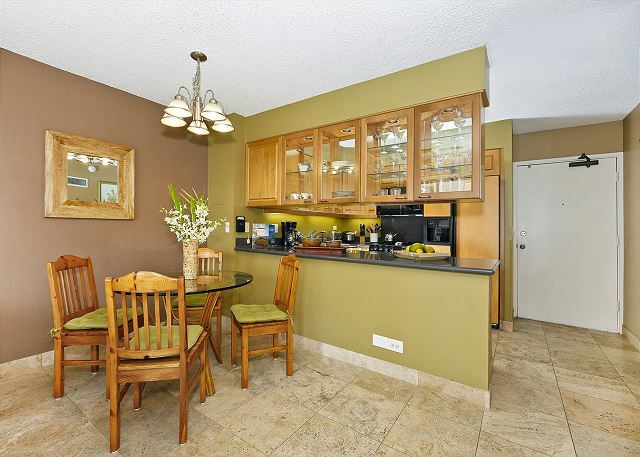 The condo was quite large, well equipped, very clean and in a great central location. The rate was very attractive too. The unit was in a great location. 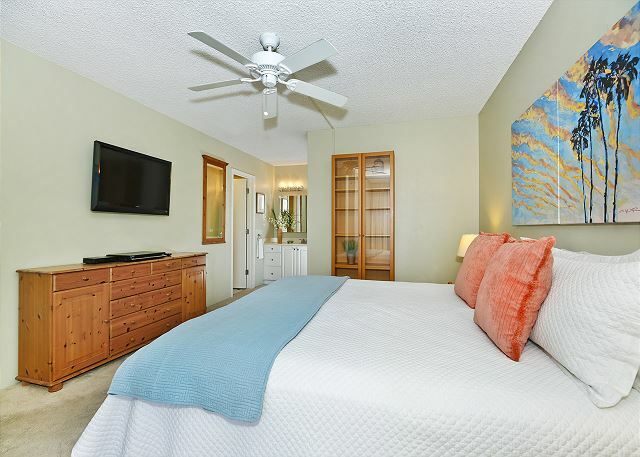 Walking distance to beach, shopping and restaurants. It was clean and very spacious. Free wifi was a little slow. People from Captain Cook Resort was through, professional with warm Aloha. Highly recommended!! We've stayed there 4 consecutive years. The condo was stocked with chairs and beach towels. The kitchen is very nice and had everything we needed. The Wi-Fi was free. The walk to the beach was a nice 3 block or so walk. The neighborhood is a bit rough so we were concerned until we got inside. The building is secure with key fob entry so we had no concerns with security. The only reason I gave it 3 stars for maintenance is that I am sure the cleaning staff should have noticed that the shower rod in the guest bath needed replaced. The spring was broken and the curtain fell down a few times, also one of the chairs in the living room lost the screws to hold it together. We had a great stay at captain cooks,it was a nice apartment , with a good location,we would recommend it to anyone, the only complaint was the beds need replacing as the two units have a a ridge where they join. Very nice condo - was everything they decribed! This was a very nice condo. 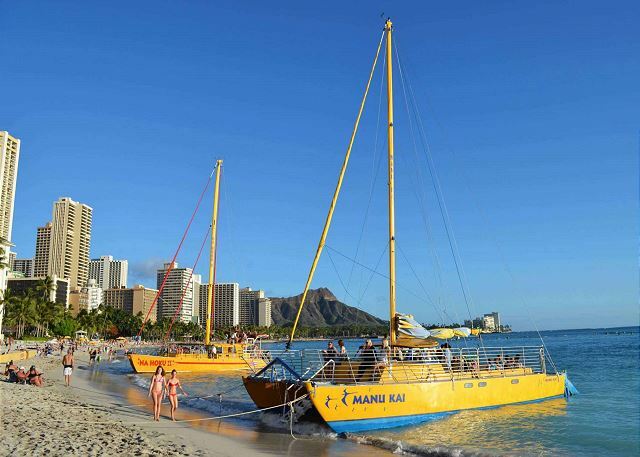 It was a very short walk to Waikiki Beach, shopping and restaurants. 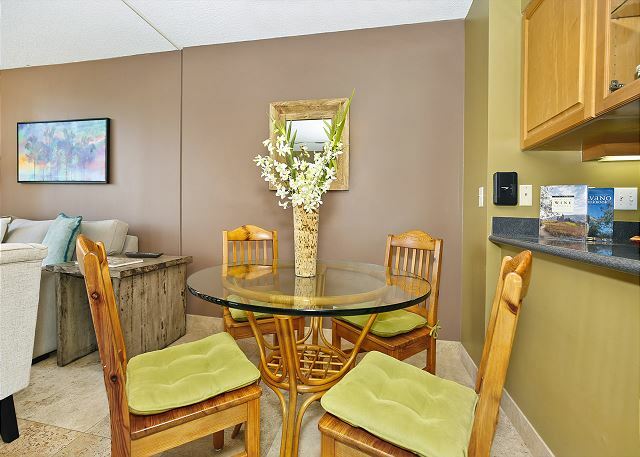 We had a party of 5 which this condo accommodated very well. It was nice to be able to eat meals in when we wanted. Having a washer and dryer was an added bonus. We would stay at this location again. We were very pleased with the property and the property managers. Property was very clean and well looked after. we enjoyed out stay a lot, everything was great, staff was helpful and apartment was very nice, clean and comfortable. We wish to come back soon. Great location-mins to shops,restaurants & beach.Also pickup points for tours.Apartment was clean & felt just like being at home.Good kitchen with dishwasher & all necessary items.Secure Building.Air Conditioned. Location quite good, but a little far from the beach, the up side is that it is quieter. The apartment had everything we needed, the fold out sofa bed was a little uncomfortable, other than that, excellent! Thank you for making our stay so enjoyable. Generally very satisfied with the stay. Will use them again for my next visit. My vacation rental hit all the key elements: convenience, location, cleanliness, cost-effective and great accomodations for family! I would stay again and will recommend to others. FABULOUS. Everything about the condo was perfect. Only downside was the parking garage - a bit tight to navigate with anything bigger than a compact. Thank you for staying with us! Because the parking stall is against a wall, it takes a little getting used to. If I swing wide with my quite large SUV, I can get it in with one pass. The upside is that it's right by the elevators. We enjoyed our stay, the condo had everything we needed and was clean and comfortable. 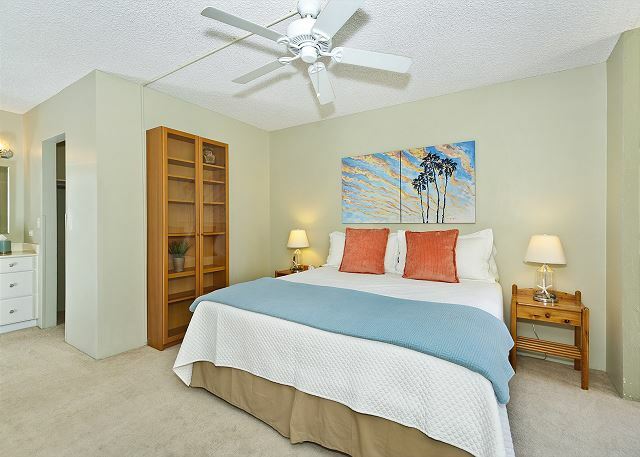 The location was great, close to shops and restaurants with a 10-15 minute walk to the beach. The Captain Cook representative was very helpful. It was also equipped with beach gears. Very pleased with property, clean and very well kept. Company personel very friendly and professional. In the past, I've stayed at a condo in the Fairway Villa, but it was occupied, so Captain Cook Resorts suggested staying at AlohaTower 12B. For 4 adults, it was very spacious and quiet if you kept the windows closed. Very conveniently located and would definitely stay there again. Neighbors are quite friendly & downstairs convenience store came in handy. The only comment to make as a suggestion is to be aware that the parking space can be difficult (not impossible) if you have a big car. Space is wide enough, but you have to deal will a long wall, big pillars and big neighboring cars. Kitchen was well equipped with all the necessities. Bryon at Captain Cook was very professional and accomodating-wanted to make sure we would have a nice stay. location is good - 2 bed rooms. Captain cook's staff is very responsive but there are some critical repairs the buillding is encountering due to wear and tear of multiple users. None the less, we will consider renting this unit again. We were generally very satisfied with our stay in Aloha towers. However, the parking spot is very difficult to get in and out. There were some small roaches in the unit but the management was very responsive to send an exterminator the very next day. We also had a flood around the laundry that seemed to come from the unit above. This condo is very nice. We are so happy to see the place, all the rooms are nice and comfort and really feel like home. The kitchen is very clean and has everything (yes everything) we need. The living room has a super comfort sofa and a little dinning table. We were surprised when we see all the stuffs for going to the beaches. 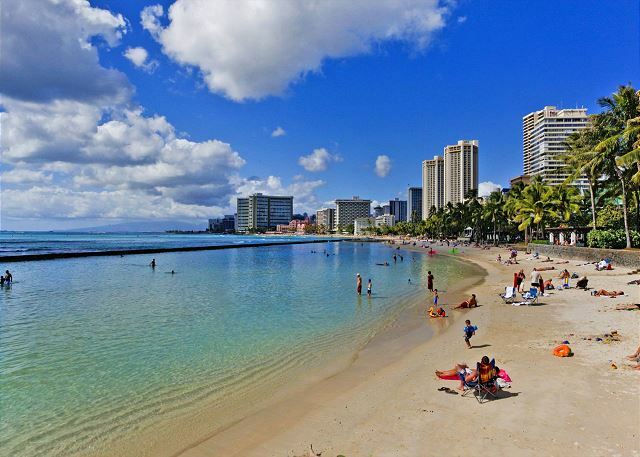 Oh also the location is super, minutes' walk to many restaurants and shopping places and also the Waikiki beach. This is a perfect place for my family, really love it. Thanks! And special thanks to Byron for the hospitality, you are very kind and helpful! I was very please of my renting experience and will rent again from your estate. This was the second time we stayed in this unit, and the nth time I have used Captain Cook. That should pretty much say it all. Great position great apartment for a family. Really comfortable, but all the doors rattled and we had to block them with cardboard so we could sleep. The pool area is old and needs some upgrading, was usable but very overlooked. The entry area was always clean and tidy, the security guards were friendly.A few more instructions on use of electrical items would have been helpful, also information about how to use the auto entry for visitors would have saved us many trips in the elevator to let people in. The beds were so comfortable, the linen good quality and electrical appliances new, The ice maker in Fridge didn't work and we had to replace batteries in all remotes. The lighting in both bedrooms was inadequit, no chance of reading in bed. The side of the spa bath kept falling off on windy days and making loud crashes. The gardens, bbque and pool area were always clean. The small shop near foyer was really handy for milk and papers. All little annoyances were forgiven as the apt was a home away from home and we would happily stay there fact found it hard to leave. great location, clean, great amenities, and Byron was professional , helpful and on time when he met us at the unit. We had stayed at the same building but different unit 2 years ago but this one was nicer (more updated). Our experiences with Captain Cook rentals has been always positive and we look forward to using them again in the near future. We were a family of 6 (2 kids ages 4 and 6) and found that we had plent of room. We used the closed-in lanai off the master bedroom for the kids to use to sleep (we took sleeping mats and light sleeping bags). That way, we didn't have to pull out the bed in the living room in the evening, which was much more comfortable. 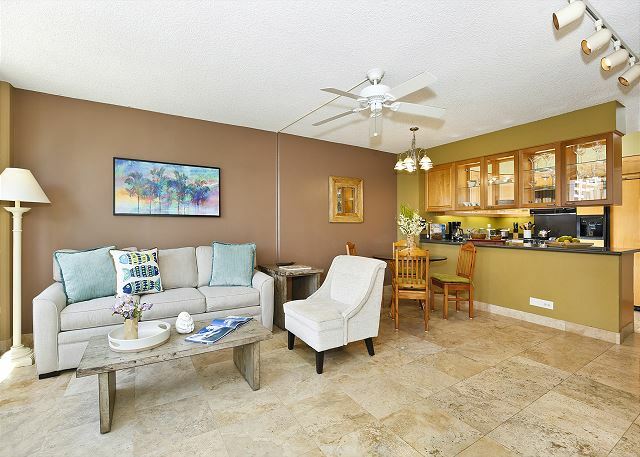 The condo was within a short walking distance to the beach and the international marketplace and shopping was just down the street. The only negative (and a very small negative) was the garbage shoot just down the hall from our condo, but that didn't affect us when we were inside the condo. 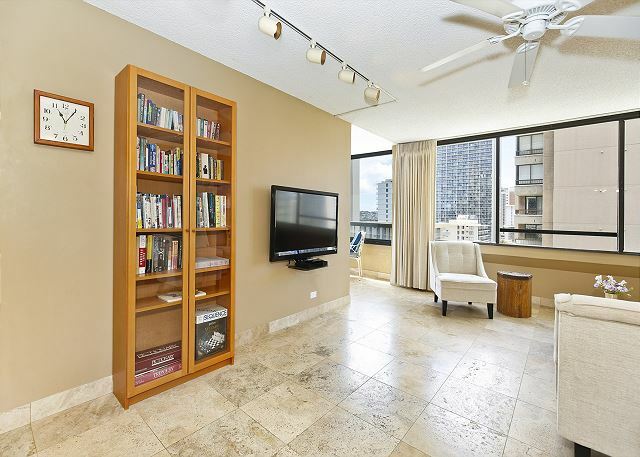 We would certainly use this condo again on our next visit to Waikiki. We didn't use the pool as we found it too cold and when we were there it was very windy and shaded. We thought 12b was very nice, but cigarette smoke, from the other units, put a damper on our stay. The cigarette smoke was very strong at times and made all of us sick to our stomachs. I believe good weather stripping on the front door would help a bit. For non-smokers, this is a real downer. There was quite a large gap beneath the entrance door from the hallway. We have installed a weather stip on the bottom of the door. There is absolutely no smoke smell inside the property now. Also this unit normally faces the upwind side of the building so we rarely smell smoke in the unit. Last week we had storms that came from the opposite southern direction. Fantastic trip of a lifetime! Taking two adult sons on holiday means there has to be space for everyone and our apartment gave us everything we all needed. 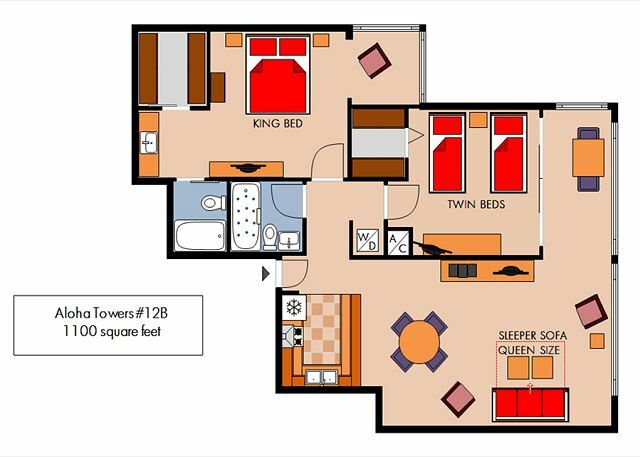 Tvs in bedrooms as well as lounge room, two bathrooms, comfortable furniture, cable tv, wireless internet so that the boys could constantly stay connected - could not fault this apartment or Captain Cook Resort. Would not hesitate to recommend them very highly to anyone and if I ever get the chance to go to Waikiki again they would be the first people I contact! Thank you soooooo much! My husband and I have had a wonderful holiday with our sons and now have many very happy memories. The condo was very clean and well kept, we were told they are updating the flooring etc which will be a great improvement. Was about 15 minutes from the beach walking with many places close to eat/shop. Nice quiet building! There is not much supplies such as sugar, salt or oil if you are interested in cooking in which we were planning to do. We ate out more than we were planning to. Other than that, it was a nice place to stay. There were enough room for 5 people. Minor issues were the dirty air vents, and the awful cigarrette smell in the hallway, which my child was very sensitive to. Could not really run the AC because we could smell it. Luckily it was not too hot. Other issue is the dryer venting into the unit. Made the place really sticky and dusty. 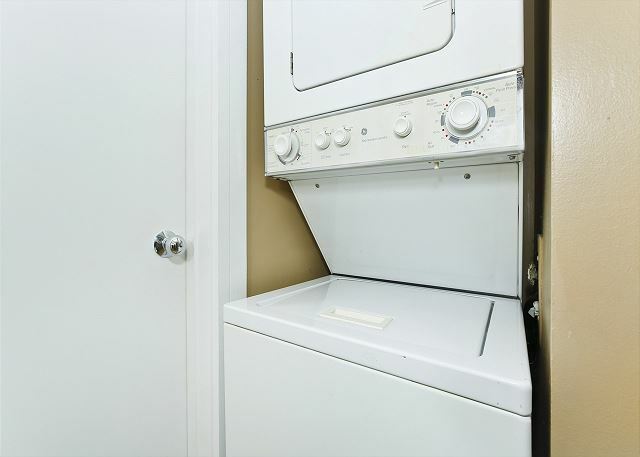 Though we loved the convenience of having a washer/dryer, made it hard to be in the unit while running it. Not sure if this can even be fixed logistically. But overall a very pleasant experience with Captain Cook Rentals. Mahalo. Once we figured out the AC, we were very comfortable. We tried leaving the windows in the lanai areas opened during the night; however, the people noise and garbage trucks woke us up. By closing the windows and running the AC on low, the noise was considerably cut down. We loved the setup and would gladly return if the opportunity arises! I have rented properties in this building from Captain Cook on multiple occasions without any problems. Nice unit, good location, would do it again. Great Location..Walkin Distance to everything..
Not a great view but close to it all.. 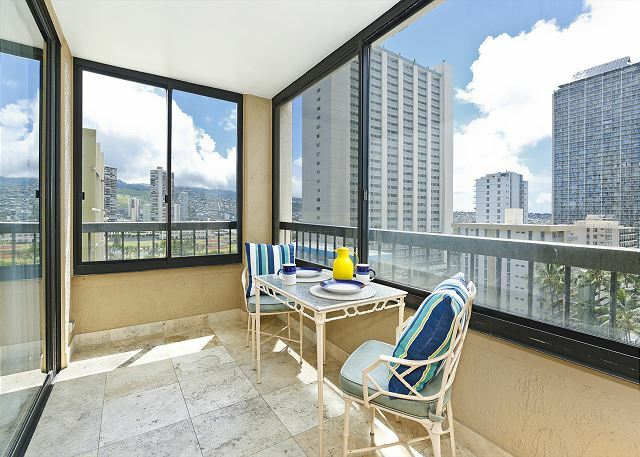 I was satisfied with my stay: walking distance to the Waikiki shops and good condition of the property. Only two minor issues, the garbage chute for the entire floor was located near the front door. The hallway leading to the front door sometimes had a funky smell due to the garbage. The other issue was that the view from the apartment wasn't as nice as the picture, a little misleading. However, overall, I enjoyed my stay at Aloha Towers and would recommend to other people. Photographs for our website are taken onsite in the unit. it is the actual view taken from the window. While it wasn't a problem, the bath mats & throw rugs were dingy and worn. Might be time to replace them. Parking spot is also a bonus. My only suggestion would be tile in front of the sink in the master bedroom. Overall, very nice unit in a good location. I liked the location. The bbq's and pool area were always clean. We stayed in B12 and the only thing wrong with that room was the location of the garbage shoot which was 10 feet or so from the front door. We did find a cockroach in our room. Most likely from the shoot area. just a minor issue. Would stay again. We have spoken with the building resident manager who is addressing the trash shoot upkeep. Both bathrooms have vents although they don't have an audible motor that switches on and off, so guests probably didn't realize it. Both have more than adequate suction from the building. We have been trying to contact the guest to see what the issues were during her stay. This condo is a favorite with return guests and was recently inspected and found to be in good condition. Before guest sayed the onwer added Tv in each bedroom and other upgrades. Guests could not remember why they gave a low rating to the property. 4/24/11. very comfortable for the 6 of us. location was great, overlooked the canal and about 3 blocks away from the beach. condo was equipped with everything so it was like home away from home. also came with parking which was good as parking outside can be limited. the stall assigned to the condo however was a bit small for our mini van. would have been nice if one of the lanais was not closed in so you could sit outside if you wanted to. overall we had a great stay. thank you. 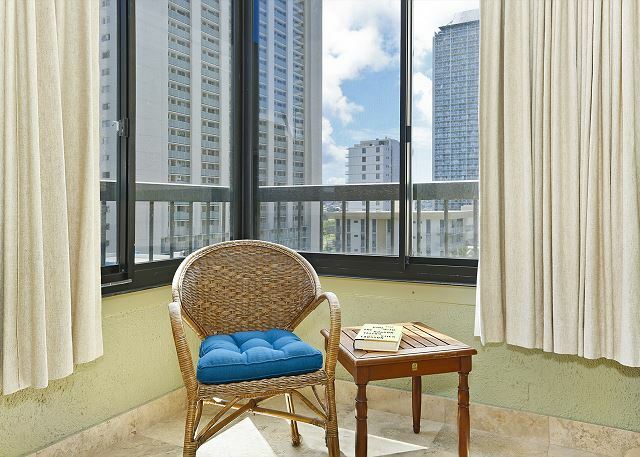 A quiet comfortable retreat just steps away from all of the activity of downtown Waikiki. With parking for your rental car, this place can't be beat. 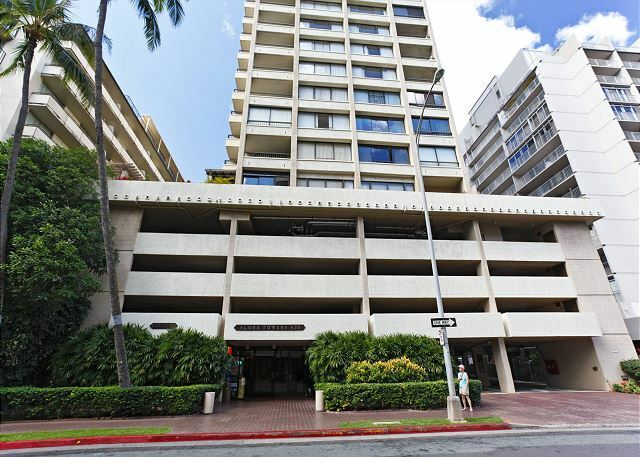 I have visited Hawaii 15 or more times over the years and Aloha Towers is my favorite location because of its' near Waikiki location, and within walking distance to the shops and beach and an assigned parking space. The apartment is in great condition and I wouldn't hesitate recommending it to a friend. We appreciated the extra towels, the flat screen Tvs in the bedroom the beach chairs and beach towels and all the other extras like hair dryers, iron, and a great kitchen. My compliments to Capt. Cook & Associates. Thank you Ingred Swensen, it was great. Great time. Loved the property. 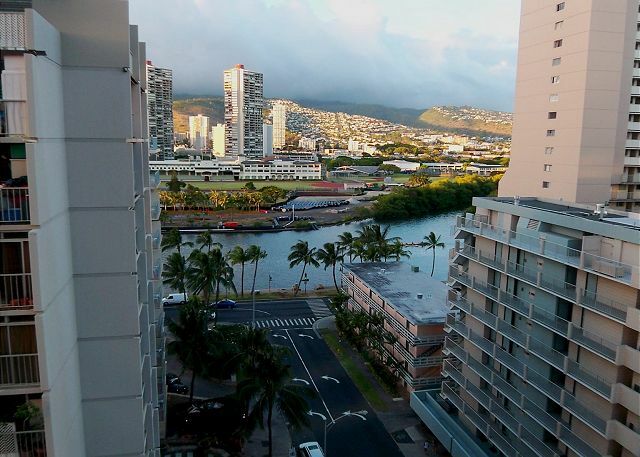 Our stay at Aloha Towers was perfect. The unit was peaceful, clean and located perfectly. This is our second year renting the same unit and hope to return again.